Set of sturdy disposable cups, bowls, plates & cutlery Heat resistant and microwavable Ecofriendly corn starch biodegrades in 6 – 12 months This complete set of disposable tableware includes 20 Cups, 20 Bowls, 20 Main Plates, 20 Side Plates, 20 Forks, 20 Spoons, and 20 Knives. With an attractive smooth matte surface, they stand up to liquids without leaking and hot foods without falling apart – you can even put the cups, bowls and plates in the microwave! 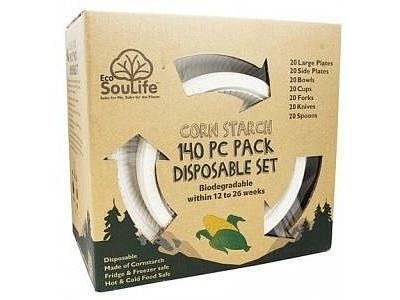 Made from highly renewable non-GMO corn starch, they’re carbon-neutral and will be gone within a year of trashing or composting, so they’re a much more Earth-friendly alternative to paper, plastic and Styrofoam disposables.